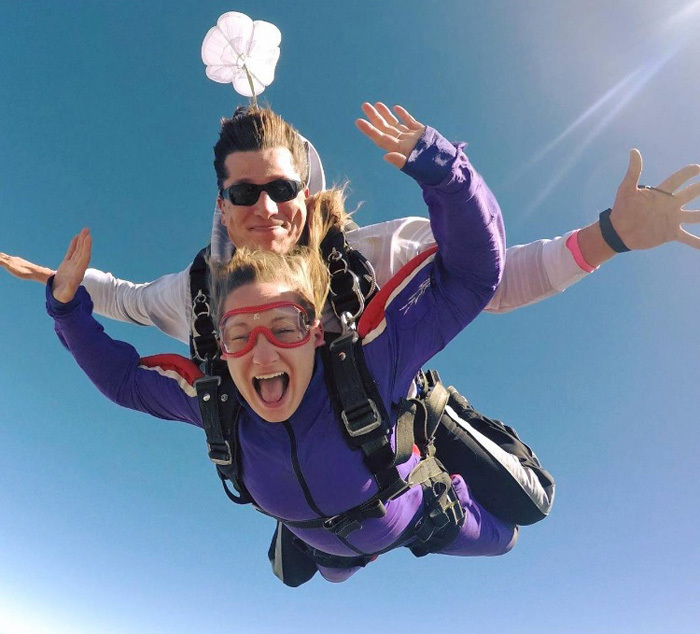 Who doesn’t love inspiring skydiving stories? You know we do. When I talk to Jake Lumsden, he’s on the ground – but he’s looking skyward. Wisconsin is cruising to the end of another long winter (which the Wisconsin Skydiving Center wisely waits out from November 1st to the end of March), but it’s a balmy 40 degrees on the ground on this particular day, and Jake wishes the props were turning. 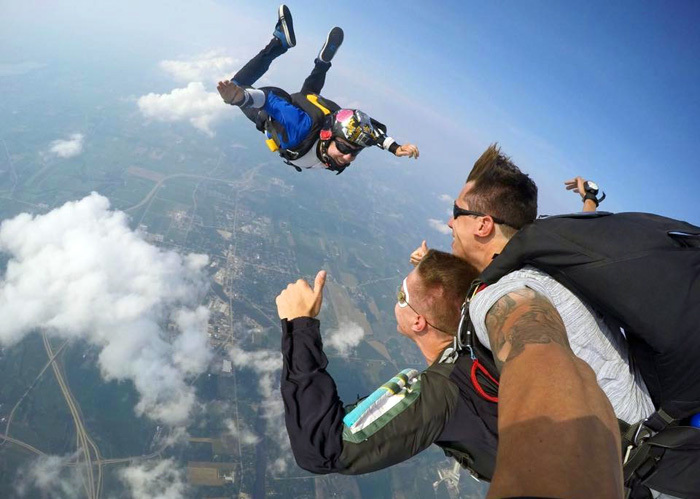 After all, he truly loves introducing new jumpers to skydiving – the sport that found him when he was in a nosedive and turned his life completely around. 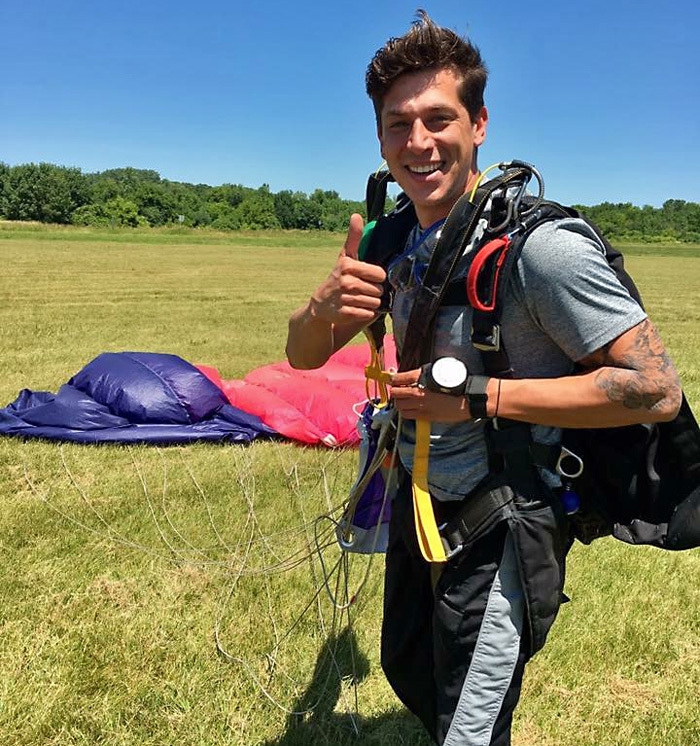 Like a phoenix rising from the ashes, Jake used skydiving to rocketship out of a gnarly life situation and into the big, blue sky. Jake gives the thumbs up after a successful jump. As it turns out, Jake’s dad’s idea was so inspired, it would turn Jake’s life into one of the most amazing skydiving stories. When Jake was 16 years old, he and his uncle were flying from Janesville to Madison. As the pair were flying over Fort Atkinson, they heard someone call ‘jumpers away’ over the radio. Jake’s uncle explained to him that they were talking about skydivers leaving an airplane, and decided to bring Jake down to check it out. They landed at the dropzone airfield – ours, which was called Atmosphair at the time – and Jake found his ticket out of purgatory. He was wowed. At the time, the rules for tandem skydiving were different. Back then, you could make a tandem jump if you were under 18, you just had to have your parents sign off. (That’s in the past now, but that’s how it was then.) But even with that hurdle absent, Jake had a steep road ahead of him to take his dad up on his offer. At the time, he was scraping by with Cs and Ds. Jake on a tandem jump, with a skydiving videographer. “On standardized tests, I scored really high, so my teachers all saw the potential,” Jake explains, “but I didn’t apply myself. I didn’t care, because I was mad at the world. I was mad because I’d been handed a really really bad hand of cards. But I had to get past that to get that jump.” It took a while, but Jake did get those grades up, and his dad came through on his promise. Jake made his first skydive when he was 17. Jake realized that, if he was going to continue, it was going to be on his own dime. Thus motivated, he applied to “tons and tons of jobs” until he got one. He knuckled down and worked until he made enough money to complete the AFF program (here at the Wisconsin Skydiving Center, naturally). These days, Jake is a skydiving tandem instructor, as well as a coach for experienced skydivers looking to improve their skills. During the wintertime and when his schedule generally permits, he also likes to get a few BASE jumps in here and there. There are plenty of antennas around, after all (and several buildings under construction in farther-flung Chicago). He’s also an accomplished day trader. In general, he’s a cheerful, clever, gregarious gentleman with the air of someone who has it figured out. We couldn’t be prouder of him – or happier to have him on our team. 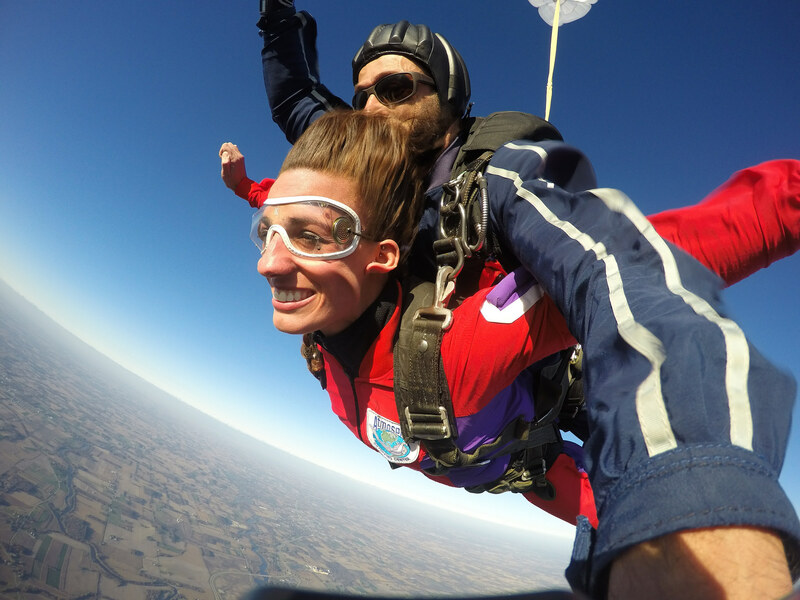 We think Jake has one of the most amazing skydiving stories out there – so come and say hi to him when you’re at the dropzone for your next tandem or AFF skydive.